WEST LAFAYETTE, Ind. — An increase in illegal methamphetamine use in Indiana has posed a serious threat to farmers who use anhydrous ammonia, but a Purdue University expert says security practices can lower the risks. Anhydrous ammonia is used widely as a nitrogen fertilizer and as an economical way to put nitrogen into the ground. But over the last few years there has been growing concern over the handling of anhydrous ammonia — largely because of misuse as a catalyst to make meth, said Bill Field, Purdue farm safety specialist. Stealing anhydrous ammonia cannot only cause bodily harm and spills, but it also poses serious risks for farmers who use tanks that have been tampered with. Stealing anhydrous ammonia cannot only cause bodily harm and spills, but it also poses serious risks for farmers who use tanks that have been tampered with. One way farmers can deter thieves is by securing all tanks, whether they are full or empty. Sometimes even measures taken to guard against tampering doesn’t prevent theft. When the chemical is stolen, tank valves can be damaged, which can cause anhydrous ammonia to spray from tanks onto unsuspecting farmers. 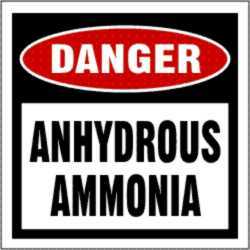 Anhydrous ammonia causes severe burns and, because it is attracted to water, often results in devastating eye injuries. For these reasons, tanks are equipped with goggles to prevent eye injuries and water for farmers to douse themselves with if they are sprayed. For hygiene reasons, however, Field suggests farmers invest in goggles of their own. Corn producers can stay safe when handling anhydrous ammonia by looking for signs of tampering and, if found, call authorities.